Today me and the chunks visited a stay and play group for the first time. With Gracie being almost two I've been feeling guilty lately about her not getting to mix with other children and having a new baby around we haven't been out much. So I decided to bite the bullet and take her to a toddler group at a local church. To be quite honest I've probably hesitated from doing this kind of thing before incase I turn up and find myself thrown into a group of clicky mums and dont fit in. Since having children I've lost contact with a lot of people and find that most days the only interaction I have is with a toddler, im sure I'm not the only mum that feels that way! The turning point for me was going to our works childrens christmas party last week with Gracie crying the whole time as it was so strange for her being around so many people and she is quite shy. I knew it was time for me to help her socialise with other children. So we turn up to the group today feeling quite nervous and I had absolutely nothing to worry about! It was the groups christmas party there were more people there than iIexpected and everyone was very friendly. First thing Gracie does is go and play with a younger baby in the toy corner without me having to sit with her (she never wants to leave our side usually when we're out). After she'd been playing a while I asked if she wanted to go do some pictures. 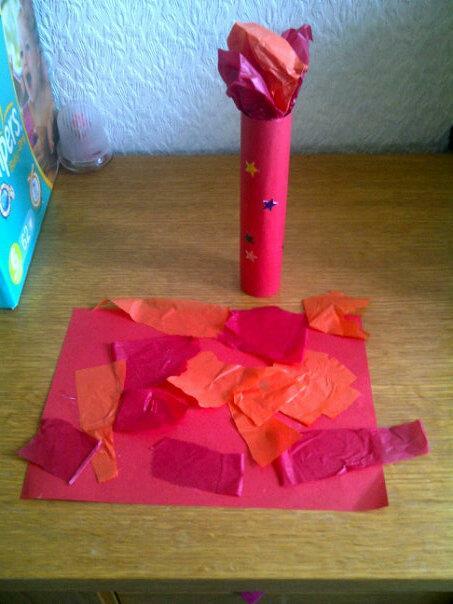 There were lots of crafty tables in the hall and the children were making candles out of card and paper so me and Gracie sat and made her candle which she covered in pretty stickers. She then made mummy a sticky picture when she was finished. Meanwhile, we've left daddy to fend for himself with Zach who was getting lots of attention smiling at all the ladies! After playing with trains and a dolls house in the play room, all the children were taken over to the church next door where they listened to a story and sang songs while the room was being transformed ready for their party food. So the children came back had some lovely food, cakes and biscuits and were all treated to a present each from Santa. By the time the party was finished my usually shy little girl was running around all excited asking for 'more party' and playing with the other children and I was left wondering why I'd waited so long. We will definitely be returning after the christmas holidays and in future I will have more confidence in myself to take them out without getting so nervous myself!